SPURS have been crying out for a creative midfield player this season and with this year being the 40th anniversary of the Double, memories of the great John White come to mind. John was signed from Falkirk In 1959 for £22,000, a lot of money In those days. Bill Nicholson had signed him when he was still in the army in Scotland and the manager had some reservations about his fitness, because he was so slight. When Bill discovered that John was a champion cross- country runner, he signed him as soon as he could. John started at Spurs as inside-left replacing Dave Dunmore and then moved to outside right. When Bill moved him to inside-right to replace Tommy Harmer at the start of the 1960-61 season, the Scotsman's career really took off. Already a Scottish international when he joined Spurs, John quickly proved his worth scoring five goals in 28 starts in the 1959-60 season. 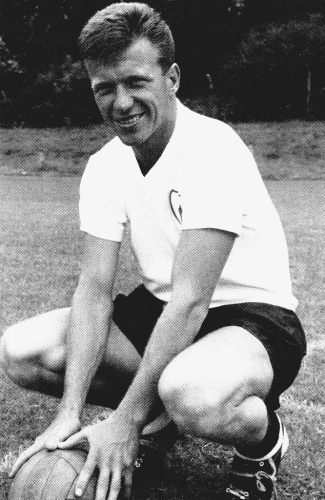 He was an ever present in the great Double season, bagging 13 goals and White won another FA Cup Winner's medal during the next season and he helped Spurs win the European Cup Winner’s Cup in 1962-63. It is no coincidence that when John was at Spurs, they had their most illustrious period in their history. Spurs' League placings from the 1959-60 season to the end of the 1963-64 season were: 3rd, 1st, 3rd, 2nd and 4th and John's contribution was enormous. Although he was shy off the field, he had great pals in Dave Mackay, Cliff Jones and Terry Dyson and the four of them would play juggling games with each other with coins and show off their skills. On the pitch, John worked tirelessly, always running to find space and looking to help the player with the ball. He had great control and could take the ball from any angle with both feet and he could pass it well, both long and short and his distribution was impeccable. White had great positional sense and he realised that it was only possible to create space by working hard and finding positions; something his great stamina aided and he made so many goals for his colleagues by passing to them in good positions and he made diagonal runs behind the opposing defences mostly unseen by good timing, hence his nickname of "The Ghost". It is apparent that John would not have been out of place in today's football era, because he had stamina, worked hard and found good positions and he always assisted his colleagues by running into space for a pass. (What would GG give to sign him now?). Although he was not renowned for his goal scoring, White netted 40 goals in 183 League appearances for Spurs, with six goals in 17 European matches and one FA Cup goal. This record is impressive for a midfield player and when his phenomenal work rate and assists are taken into account, he was, without doubt, a huge contributor to Spurs’ success. He had been the main fuse that lit up the Spurs attack, as he was so selfless and was a real team player. Not seeking glory for himself, but he always worked for the good of the team. White had great speed too, but this was not always evident. In many ways, he was years ahead of his time and he seemed the complete footballer. Sadly, John White died when he was struck by lightning whilst sheltering under a tree, pursuing his hobby of playing golf at Crews Hill in July 1964. He left his wife, Sandra and a young family. Tottenham did not scale the same heights after he died and he left a great void in midfield, which could not be adequately replaced. How great a footballer he would become we will never know, but he left beautiful memories of five successful seasons at "The Lane." John had it all; creativity, vision, stamina, a great engine and speed. He was an invaluable team member and "The Ghost" would be the creative midfield player that we need right now ... dream on.